The universe as we know it and see it exists mentally before it can exist in any other form. I think therefore I am. This statement from philosopher and scientist René Descartes isn't far off from the axiom above. In order to process existence, to analyse both science and magic, we must first think. Everything that happens within our minds is then translated through that mental lens and into the physical or spiritual world - or both. The material universe is contained within the framework of the mind, and our perception of it is constructed by our thoughts, feelings and beliefs. We experience the universe through these perceptions, through this mental visualization. What we see, what we know, is all translated through the mind. Manifestation first occurs within the mind. If the universe and how we experience it is affected by our mind, then we can manipulate our experiences through the mind. Your mind is your power. This is why visualization is such a key component of witchcraft. This is why we walk through guided meditation and why energy work is often seen first in the mind and then expressed in a different plane. By being able to create the framework in our mind, we can better produce it in the physical or spiritual planes. Though all is mental, we are not The All. That being said, it would be a bit egotistical to assume that, because everything we see, do and witness is processed first through our mind, that somehow conflates us with an all-seeing, all-knowing deity. The state of things within the physical universe isn't Schrodinger's Box; if we can't see it, it doesn't mean it exists in a state of maybe until it reveals itself to us. People don't magically materialize into existence when we think of them. Everyone is their own unique and distinct being. Some interpret The All as a deity, a pantheistic god that is present within everything. If you're theistic, this may very well be your interpretation of it. That being said, it's important to note that this principle insists that deity is not outside of the universe but rather within it and thus constricted by the same rules and laws we are. As a nontheist, however, I see The All instead as a universal consciousness from which all things manifest. Mentioned multiple times within The Kybalion, The All is unknowable and infinite. To me, this implies that The All is a universal consciousness of every living being. We could not possibly know the thoughts of every single being on earth, these thoughts would be infinite and, as long as life continues to exist, there would be no end to it. If this is the case, then we all contribute to this consciousness, each of us visualizing and creating at every moment of the day, expanding the greater mental universe at an exponential rate. If we are all part of The All, this explains how we're able to manipulate it by mentally processing our own corners of the world. This could even explain multiple deities for polytheists as, just like humans, they would have their own mental universe and their own pulls. By saying the universe as we perceive it is a mental construct gives a working template for how magic works and how we can affect the world around us without affecting the universe as a whole. Through visualization and meditation, we can first create the framework for magic utilizing our mind. However, when that visualization crosses the boundary into the physical universe, it is still constrained by natural law, by science. Perhaps this constriction is created by the billions of minds working together to create physical law, or perhaps the physical universe operates on a lower, more restricted version of our mental plane. 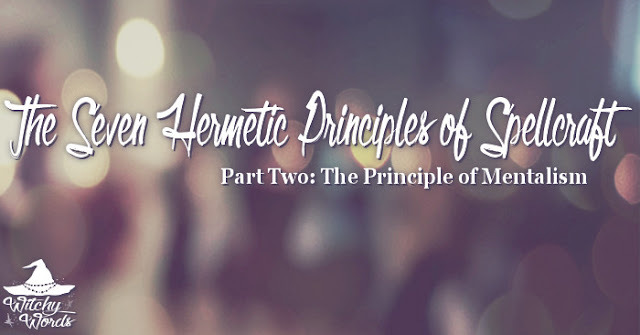 All of this, we will dive into more thoroughly through the subsequent principles. If the universe is mental and The All is mind, then the perfect representation of this principle is a perfectly clean whiteboard. Anything you can think of can be conveyed through this whiteboard, yet it's still constricted, once marked down, by the laws of science. This translation from our minds to the whiteboard comes with rules and limitations, just as the translation from our mental lens into the physical universe does as well. To directly apply this principle to your spellwork, begin with a visualization such as meditation or, as a more advanced technique, astral travel. Formulate your needs and your spell mentally before approaching it in any other manner.